Ted and Jean Bloch were taking care of us while Mother and Daddy were at the hospital waiting for the baby to pop out. We knew that Mother had a big belly so we thought she would just break like a balloon. We were so excited to have a new family member. Early the next morning, Jean Bloch came to give us the big news. “Where is she? I want to see her with my own eyes.” I jumped at this news. 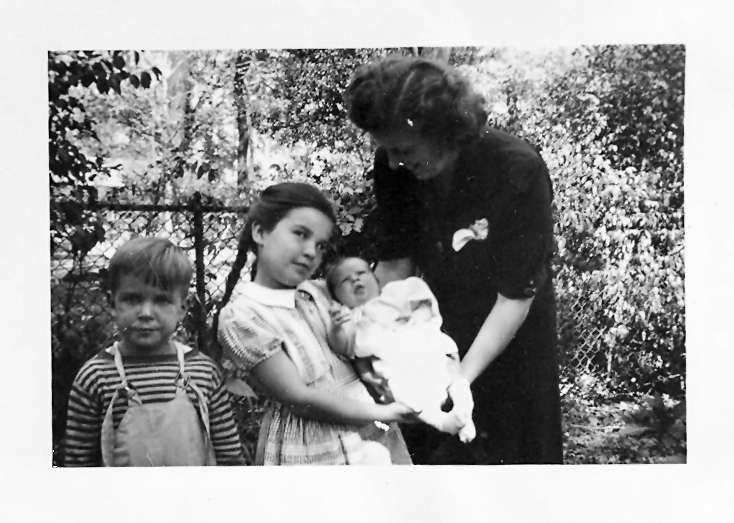 Jean told us that Mother and our new little sister would be home in about two weeks. “How can we ever wait that long? Can’t we go to see her and mother in the hospital? Why not? “Is our new sister going to sleep in this cage?” My brother demanded. Tommy brought in some blocks and I went to get a doll for our new sister to play with. “What about this rubber Ducky that squawks?” Tommy was jumping up and down and squawking the Ducky. “Is that like things from Germany?” I asked with remembered messages about the Germans in the war. “Even our fingers?” I asked. “When, when, when are they coming home?” I squeaked. “Let’s look at the calendar. I think it will be September 23. Let’s circle that day. Everyday you can take turns crossing out the days. So tomorrow you can cross out today, Tommy. Then Jannie you can cross out the next day after it is finished. Everyday you can count to see how many days are left.” Jean offered. Finally the day arrived. We thought it was a very, very long time even a year but it was about two weeks. Mother was sitting in the car wearing her coat with the fluffy fur that covered her mouth. In her lap was this tiny, tiny little baby. Jean had told us to wait in the house until they came in. Daddy went around to open the door and he took the baby. Then Mother got out. Daddy handed the baby back to Mother. They got out of the car by the driveway where the steps to the porch are. They walked up the steps so so slowly. We could see them from the Music Room window come up the steps. We ran to the front window and got there before them. Then they passed by the window near the front door. Daddy opened the outside door. We opened the inside door. “Oh, Dear little sister, we have loved you from the moment you popped out of Mommy. Can we kiss her? ” I whispered. We were all so happy. After all, I was eight years old and in school. Why couldn’t she be my baby? This entry was posted in childhood experience, Experience the Moment, love of life and tagged childhood oberservatons, early childhood experience, family life, NaBloPoMo, NaBloPoMo November. Bookmark the permalink. I’m enjoying the Kimbark Chronicles so keep them coming. Let me know Alejna’s address when you have a moment. The popcorn tins are ready to go.